You’re Starting a Keto Diet Plan—Now What! We are republishing this article by kind permission of the Keto diet plan Our thanks and appreciation go to them for such an excellent and informative article. Ketogenic diets (aka the keto diet plan) are growing in popularity throughout health and wellness subculture. The term ketogenic/ketogenesis describes the process of the body creating ketone bodies, which work as an energy source (in addition to fatty acids) when carbohydrate intake is low. Therefore, ketogenic diet plans are inherently comprised of high protein and fat intake with very low quantities of carbohydrates. As a result, the body is required to utilize fats and ketone bodies for energy rather than glucose from carbohydrates. Ketogenic dieting is becoming a major focus for health and fitness enthusiasts, due to the bounties of clinical research backing its therapeutic properties. These benefits typically include better mental function, more stable energy levels, quicker weight loss, and enhanced longevity. While you may know that a ketogenic diet meal plan is a low-carbohydrate way of eating, there is much to learn about how it works and what you can do to successfully follow it. In this guide we will take an in-depth take a look at the physiology and benefits of keto dieting, the various types/variations of keto diet plans there are, and how to set up your very own keto diet plan (along with a sample meal schedule). But what is ketosis? Ketosis is a natural metabolic process where your body uses fat for biological necessity during times of nutrient deprivation (mostly carbs). When following a ketogenic diet, your brain, as well as other organs, depends on ketones as an energy source. Ketones are produced in the body once you have reached a state of nutritional ketosis and can be measured in the blood and urine to ensure that you stay in ketosis. What will my ketogenic diet meal plan consist of? A typical ketogenic meal plan consists of about 10% of total daily calories coming from healthy carbohydrates such as leafy greens, non-starchy vegetables, and limited amounts of legumes and high-fiber fruits; 20% to 30% of calories coming from quality proteins such as animal meats and certain plants; and 60% to 70% of calories coming from healthy fats such as coconut, avocado, medium-chain triglyceride oils, and nuts/seeds. This approximate macronutrient ratio is a general guideline for your entire day’s worth of foods/calorie intake. Your ideal keto diet macronutrient ratio may need to be slightly modified based on your physical activity and personal health goals. To calculate your ketogenic diet energy needs, use a basal metabolic rate calculator, then divide your calories proportionately using the above recommended macronutrient ratios. Remember, protein and carbs have four calories per gram; fat contains nine calories per gram. The ketogenic diet plan is more like a shift in the primary nutrients you consume rather than a complete diet overhaul. The biggest difference is cutting out processed foods, carbohydrates, and foods high in sugar, which is a lot easier than it seems once you learn how to replace foods high in sugar with foods high in protein and fat. A diet low in carbohydrates and high in fat will lead you to eat foods high in protein and fat and very few carbs per serving. This means you’ll be eating plenty of meat, full-fat dairy and vegetables. You will consume very little fruit, if any at all, and no grains whatsoever. Let’s start by breaking down your protein intake while on the ketogenic diet plan. People who adopt a ketogenic diet are attracted to the idea of eating hearty and satiating foods. Along with having a large percentage of fat, you’ll need to monitor your intake of protein. It’s very important to understand how protein works within the keto diet and how to obtain optimal results. Since you’re virtually eliminating carbs out of your diet, some think that they need to increase their protein intake. This is not the case, and in fact, too much protein can actually knock you out of ketosis. A common fallacy is that the ketogenic diet is a high fat and protein diet. This is incorrect, it’s a high-fat, moderate-protein, and restricted carb diet. As explained earlier, ketosis occurs when the body uses ketones as fuel instead of carbs. People fail to understand that in the absence of carbs, your body can generate energy by breaking down proteins into glucose. This process is called gluconeogenesis. If you consume more protein than what’s necessary for your body, then your body will react by spiking your insulin and reducing the levels of ketones in your blood. This means, if you’re restricting your carbs, your body could instead go into gluconeogenesis instead of ketosis and you won’t experience any the benefits of the ketogenic diet. Now that you have a brief understanding of why too much protein is not good for the ketogenic diet, it’s time to learn how much protein is optimal for staying in ketosis. You’ll want to start monitoring and calculating your macronutrients (protein, carbs, and fats). You can use this keto diet calculator to enter your information and find out how many carbs, protein, and fat you should try to consume on the ketogenic diet depending on your dimensions. It also depends on your lifestyle (how active you are) as well as age, gender, etc. It’s likely you’ll need to adjust your macronutrients, which is not a bad thing – your low-carb, high energy dietary choices may just need to modified. Most veggies are low in carbs, which means you can eat half a plate full of them, and still consume fewer calories than a single serving of other types of keto-friendly foods. Vegetables are high in fiber, which is not only great for helping to control your appetite but is also great for your digestive system and overall health. If you aren’t accustomed to eating multiple servings of vegetables every day (because let’s be honest: many of us are not), it isn’t so hard to make this kind of positive change as part of a new diet. Nerd Fitness has a detailed guide to help you ease your way into eating more life giving whole foods and vegetables (even if you think you can’t stomach them). You want to go for vegetables that are dark and leafy for the most part. Anything that looks like spinach or kale. Vegetables that are grown above ground (cruciferous vegetables) are optimal. Here’s an easy to read chart to help you understand which vegetables to eat and which to avoid while on a ketogenic diet. Saturated fats are typically solid at room temperature (butter) while unsaturated fats are liquid at room temperature (olive oil). Saturated fats are found in animal products, such as meat, dairy, and eggs, while unsaturated fats are derived from plant sources, such as nuts and seeds as well as some fruits (avocados and olives). On the ketogenic diet plan you will consume a certain amount of fat grams per day based on your specific parameters and diet goal, so do your best to consume equal amounts of saturated and unsaturated fats for best results. To increase the likelihood of succeeding with your ketogenic diet, you’ll want to eliminate as many food urges as possible. This is critical in order to prevent times of weakness from destroying your hard work. Flour, pizza, pasta, bread, cookies, cereals, crackers, corn, oats, potatoes, rice, and pastries. Any refined sugar, sweets, desserts, fruit juices, milk chocolate, pastries, soda, etc. The typical Western diet has a ratio of 20:1 Omega 6 to Omega 3 fatty acids. It should be no more than 4:1 before elevated inflammation and oxidation occurs in our bodies – which leads to multiple diseases. Stay away from factory-farmed fish and pork due to their high Omega 6 fatty acids within them. It’s recommended to avoid most fruit, but if you decide to indulge in fruit, you can eat berries in small amounts. Do not consume any beans, peas, or lentils due to their high carbohydrate content. Avoid packaged products that contain trans fats, preservatives, added sugar, and any other junk that you can’t pronounce. Avoid beer, sugary alcoholic mixed drinks, and sweet wine. Sweeteners such as Splenda or Equal that contain Aspartame, may cause food cravings or other issues. Most of these products are either high in carbs or contain large amounts of artificial ingredients. Like any lifestyle change, you need to get into the right mindset and plan out your journey. If you don’t strategize your fitness goals, the odds of success will drop dramatically. You don’t want to be the average person that “says” they’ll make a change, you want to be the person who actually follows through with it. It’s in your best interest to see a professional (doctor and/or dietitian) before going on this diet to (a) get your blood tested to verify you don’t have any underlying conditions and (b) make sure you’re able to make healthy nutritional choices instead of just cutting out food and eating too little. Get rid of all non-keto foods – Go through your fridge, pantry, cabinets, and either give away or toss-out all foods that aren’t keto friendly. Learn how to read nutrition labels – Find out what macros are and how to count them. It’s a necessity to learn the basics before getting involved in the ketogenic diet. Gradually decrease sugar and carb intake – Your transition into ketosis will go much smoother if you taper off your carbohydrate intake rather than go cold turkey. The likelihood of dealing with “keto flu” will decrease and you’ll be more comfortable in the beginning stages of your transition to being fully keto. Drink a lot of water – Keep yourself well hydrated before and during your transition so your body adapts smoothly. Learn how to measure ketone levels – It would be in your best interest to learn nutritional ketosis levels so you know how to troubleshoot any future issues. How can I benefit from a keto diet meal plan? Clinical research and scientific evidence suggests that a ketogenic diet offers a multitude of health benefits, such as enhanced energy, weight loss, increase in cognitive performance, support for blood sugar balance, and improvement in cardiovascular health. While following a ketogenic diet plan, the brain utilizes ketone bodies instead of glucose as its primary fuel source. This switch encourages more production of brain-derived neurotrophic factor (BDNF), which promotes enhanced neuron function, better mental alertness/clarity, and improved cognition. Studies have shown that low-carbohydrate diets help support insulin metabolism in the body. , The reduction of carbohydrates from your diet helps you maintain stable blood glucose levels by breaking down fats and proteins (which are long-term sources of energy). A reduced-calorie ketogenic diet encourages your body to use fat for fuel, and clinical findings support its use for weight management. Additionally, a ketogenic diet may help to suppress appetite and reduce cravings as ketones increase satiety signals in your brain. Carbohydrates only go so far to sustain energy throughout the day, especially during a workout. In ketosis, your body uses fat and ketones as fuel instead of glucose, providing your body and brain with a consistent supply of energy necessary to sustain physical performance. Research demonstrates that a ketogenic diet can help support healthy blood lipid balance and cardiovascular function. In fact, inflammation and oxidative stress both tend to be lower in people who follow a keto diet vs. a high-carb diet. The variation of ketogenic diet plan you follow will differ based on your goal and body tendencies. It is generally recommended to use standard ketogenic diet during the initial transition to a low-carb lifestyle and state of ketosis. After your body has become “fat-adapted,” you can experiment a bit and select which keto diet plan to stick to in the long-term. The standard keto diet plan is best for people who are just starting on a low-carb regimen and want to adapt to ketosis quickly. This plan is also best for those looking to improve their health and longevity. If you notice that being strictly on the standard keto diet makes you sluggish and unable to exercise adequately throughout the week, then it is ideal to integrate periodic carb feedings via targeted keto dieting. To do this, consume about 30 to 50 grams of carbohydrates along with moderate protein and fats as pre-workout meal (up to five times per week). A cyclical keto diet meal plan is a progressive type of ketogenic dieting that entails intermittent carb “refeeds” on certain days of the week. For example, you may choose to refeed every Sunday with 300 grams of carbohydrates added to your diet (you should lower your fat consumption on these days). This allows your body to replenish muscle glycogen and may be best for highly active individuals and those who exercise rigorously. The next section will dive into the supplements you should consider while following a ketogenic diet meal plan. Read on to learn all about the supplements we recommend for optimizing your ketogenic lifestyle! Exogenous ketones are typically bioavailable beta-hydroxybutyrate (BHB) salts – a source of exogenous ketones that rapidly induce nutritional ketosis (generally within 30 minutes) to support your ketogenic lifestyle. Induces acute nutritional ketosis within 15 minutes of ingestion. Acute ketosis occurs when blood ketone levels temporarily rise above 0.5 millimoles per liter. MCT oil is a mix of caprylic (C8) and capric (C10) acid triglycerides – special types of medium-chain triglycerides (MCT). MCT may help support cognitive health/function, and pre-clinical research suggests MCT may benefit mitochondrial function. Supplementing with MCT oil also temporarily increases levels of ketones, which serve as an alternative energy source in your brain and muscle tissue. Helps to increase ketone production and provide energy. Medium-chain triglyceride supplementation may temporarily increase ketone production in comparison to common long-chain triglycerides. Electrolyte levels in your body can drop when you’re on a ketogenic diet plan due to reduced cellular hydration. It’s wise to consider using an electrolyte/mineral supplement in such instances, such as Pedialyte, or taking extra minerals in pill form. Helps maintain healthy micronutrient values in your body. Starting a new way of eating such as the keto diet meal plan can be overwhelming, especially when you’re used to eating a lot of carbs and processed foods high in added sugars (it’s okay, we’re all guilty!). 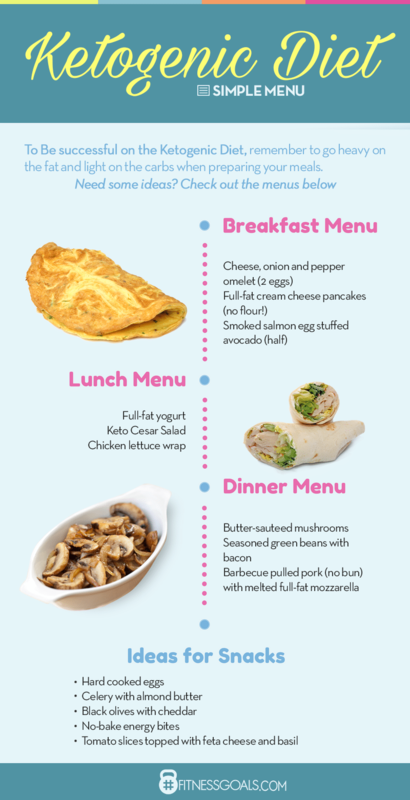 Here’s a sample keto menu outlining what one day of eating on the ketogenic diet might look like, including low-carb suggestions for delicious, healthy snacks. 1) Do I measure animal protein raw or cooked? – You want to measure animal protein raw; certain animal proteins shrink by as much as 40% when cooked (which can skew your serving sizes). 2) Should I monitor my blood ketone levels? – Not strictly. It may help to have a blood ketone monitor just to be sure you’re eating properly for ketosis, but it’s not required. 3) My urine smells fruity, is this normal? – Yes, ketones have a fruity smell that gets passed to your urine. 4) I’m constipated, what can I do? – Increase your MCT oil consumption to one tablespoon twice per day (or higher); this will assist in moving your bowels. If you want to see real results, check out these keto diet before and after photos. We think that this video really complements the excellent article which is published above. Very informative indeed! Who Actually Needs Vitamins For Their Health! What’s Keto Flu and How Do You Cure It!